Want to provide safe nesting boxes for wildlife in your garden? 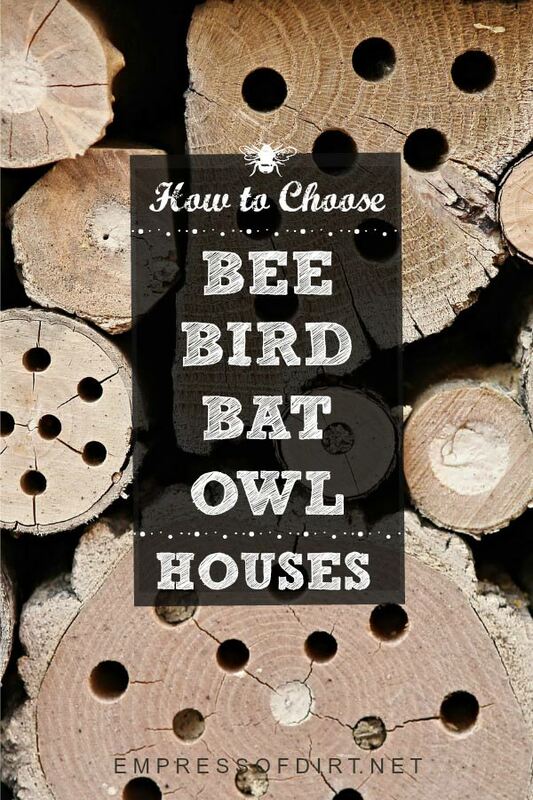 See how to choose safe and eco-friendly houses for local birds, bees, bats, owls, and kestrels. 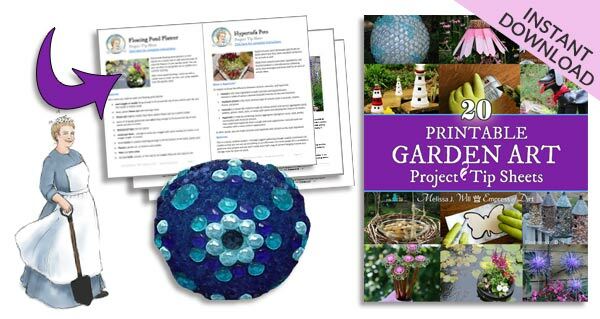 There are more tips, projects, and interesting stories about backyard wildlife here. These nesting boxes and houses are suitable for bees, bats, birds, and larger species including owls and kestrels. To ensure we provide houses that truly benefit local wildlife, there are a few things to consider first. 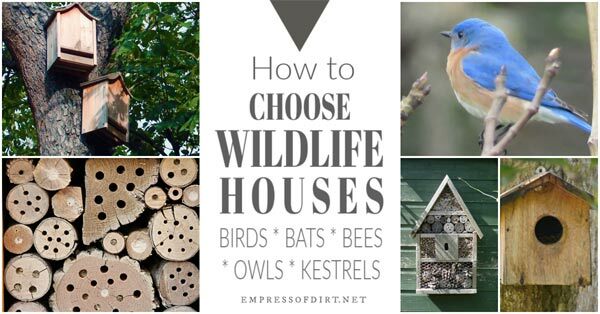 Should I have a wildlife house? And if so, what type should I get? Most animals are territorial, so unless you have a large property with plenty of trees and other natural resources, you should probably narrow your choice down to one box. It’s rather crude and counter-productive to house both the hunter and the hunted. I suggest contacting a local conservation authority to learn about species at risk in your area and see what they suggest. They will also know about invasive species in your area and what you should avoid. Also, consider the big picture. While we often like to decorate garden art, most nesting boxes are best left in natural colours that blend in to their environments. No one wants a brightly-colored sign on their house alerting predators. The one exception is bug houses as decorative paint colours likely do not affect the wee occupants. My other piece of advice (as always) is garden organically. There is no sense in trying to attract wildlife to a toxic or unhealthy environment. The main reason to offer housing is to provide something lacking in the local habitat. The side-effect is our enjoyment, witnessing these wonderful creatures going about their lives. The style, type of wood, and placement of nesting boxes is also very important. Always choose untreated wood free of preservatives and harmful chemicals. I’ll walk you through more details below. Once you’re all set up, it’s really cool to watch and learn as the bees, birds, bats, and owls move in. Bee houses are attractive to the type of bee called solitary bees. Unlike honey bees that use hives, solitary bees make individual nests in hollow reeds and twigs, tunnels in the ground, and holes in wood. This group includes leafcutter bees and mason bees. Both are essential pollinators and rarely sting. Also, solitary bees do not produce honey or beeswax. There are some disagreements about whether bee houses are indeed beneficial. Two of the concerns are how these houses can attract invasive bees and wasps as well as spread fungal diseases. You may want to do further research on this first. In general, bee houses should be placed about 3 feet (1m) off the ground in a full-sun area. I made my own bug house which you can see here. Related: This Bee Knowledge Quiz has lots of interesting info. Impress your friends! Birdhouses like this are cute in the garden but not appropriate as nesting boxes. And, while some birds may build nests in them, often the designs prove hazardous. Two common problems are the size of the entry hole and the depth of the box. Unless the hole is sized specifically for the species, predators can get in or the young birds (when plump and ready to fledge) cannot get out. If you have decorative birdhouses as I do, consider covering the holes with screen so the temptation to nest in there is removed. Proper nesting boxes are made specifically for each species of bird. The one shown here is for Bluebirds. Location and spacing of nesting boxes is also important. Be sure you can hang the box at the recommended height and direction, out of direct wind. Some birds are attracted to nesting boxes with shrubs nearby while others like a clear path in and out and some direct sun for warmth. Most birds like some space between their nests to limit the competition for resources. It’s a full-time job retrieving food for newly hatched birds! Also, proper nesting boxes should have access for cleaning after each season. Just like bird feeders and bird baths, they require regular maintenance to avoid the spread of disease. Boxes for owls and kestrels can be quite heavy and require careful planning to safely hang them in best location without damaging trees or risking a fall. Determine the species you are housing and find out their needs. Some owls, for example, need their boxes lined with wood chips to help keep their owlets warm. It varies by species, but in general, some owls and kestrels will only nest in woodlands (which may be at the back of your property). Others may use boxes on isolated trees, mounted approximately 15 feet (5m) off the ground. Get specific instructions from a local conservation authority to choose the best box and setup for your area. Local conservation groups often share bat house building plans and instructions if you want to build your own. In general, a bat house needs to be at least 25 feet (5m) off the ground with minimal obstructions for flight to and from the house. It can take a few years for bats to adopt these houses so be patient before deciding to try another location. That rough wooden area leading into the house (at the bottom) is called a bat ladder and important for the bats to get safely in and out. I hope you’ll consider a wildlife house. My own chickadee and wren houses provide safer nesting quarters and plenty of entertainment for the gardener (me). How to Hand-Feed Wild Birds | Have them eating from your hand! How Birds Survive in the Cold Weather | Feathers are one reason.